2015 Race Prep and more. The tension is mounting in the duck garage as we rapidly approach the first race of the season at Concept Haulers Motor Speedway this weekend. There is so much work to do in the next few days it feels like we will never be ready. Jason is getting a antsy and keeps asking to buzz around the neighborhood in the kart. Until very recently I had been rebuilding last year’s kart. I had taken it apart and stripped and inspected the frame for cracks or other problems. Not seeing any problems we took it to a powder coater for a nice clean black finish. In the meantime, I turned the motors – a Briggs Animal and a Briggs LO206 – over to Regan at 4 Cycle Central for upgrades and tune ups. Once the chassis was back I started to put all the pieces back on trying to remember the fine details of installation and setup. The LO206 Cup recently announced that they are adding Briggs Animal classes. Then, working with the Championship Enduro Series, they announced that there would be a championship that would cover both series using combined points. We had already planned to race the LO206 motor with the 206cup and the Animal motor with CES. If we got a second kart Jason could also race the sprint with the Animal motor. This means a run for 4 championships in 2 series: LO206 Sportsman (206 Cup), Animal Sportsman (206 Cup), Novice Jr (CES), and Animal Sportsman (Combined). It gave me pause, lots of driving and lots of work, but lots of fun. So, after much consideration and number crunching, we headed to 4 Cycle Central to pick up the refreshed motors and a 2004 Coyote Kryptonite. While we where there we added seats, installed the motors, and aligned and scaled the karts. To scale the kart we put each wheel on a scale and then made sure that the weight was equal with a slight bias toward the rear. The balance makes sure that the kart can turn equally well left and right, and the rear bias helps keep the rear wheels and the power on the ground. 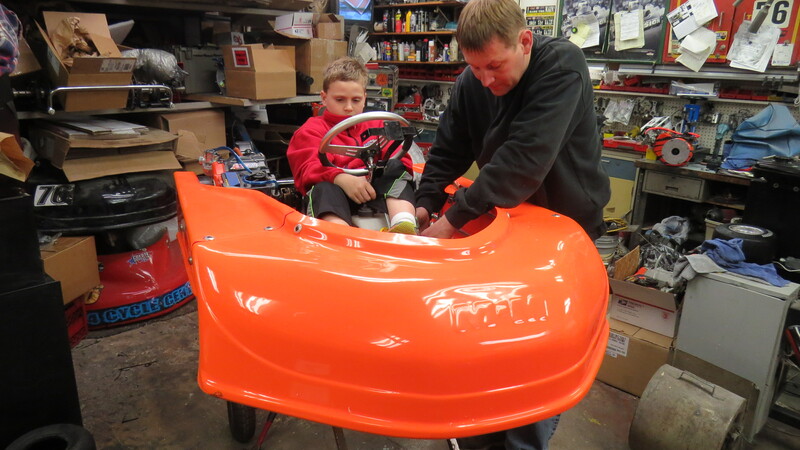 The first race of the season and test of the new kart will be this Saturday at Concept Haulers Motor Speedway. The weather is expected to be cold but dry. Thanks for Regan and the 4 Cycle Central team for getting ready so quickly for our very early start, My lovely wife and daughter who are about to embark on their own summer adventure by competing in western horse shows.